If you’re involved in a major kitchen remodel or just making some cosmetic updates, choosing the right material for your countertop will support your family’s lifestyle for years to come. Popular kitchen countertop materials include granite, quartz and butcher block. Based on your family’s every day routine, it’s important to pick a material that is the most realistic and functional. Quartz countertops are practically maintenance free. They’re also stain, acid, scratch, and impact resistant. Unlike natural stone, they never need to be sealed, and are available in an endless range of colors and patterns! Quartz countertops are perfect for busy families who use their kitchen multiple times a day. Probably one of the most popular kitchen countertop materials, granite is a good choice for a traditional look and feel. It adds a high-end look to your kitchen but also provides a durable prep surface. Granite is a natural material, which appeals to most homeowners. Granite does require annual sealing. This is by far the most budget-friendly option in terms of kitchen countertop materials. Laminate surfaces can be made to resemble natural stone and wood at a fraction of the cost. Although not high-end in appearance, laminate is a great option for the budget-friendly shopper! Butcher block countertops bring warmth to a kitchen and offer a country cottage feel. Wood countertops are decorative, yet functional, making food prep easy and cleanup a breeze. Wood is highly heat-resistant so you can put hot pans on the surface without a worry! These countertops are great for a busy family who wants functional and style all in one! Carrara marble is trending! Not only is marble aesthetically pleasing, it also offers timeless appeal and gives any kitchen that high-end look. Cost wise, you’re going to spend more than you would on a granite countertop. However, marble tends to stain more easily than granite because it is very porous. Regular sealing and special care is required. 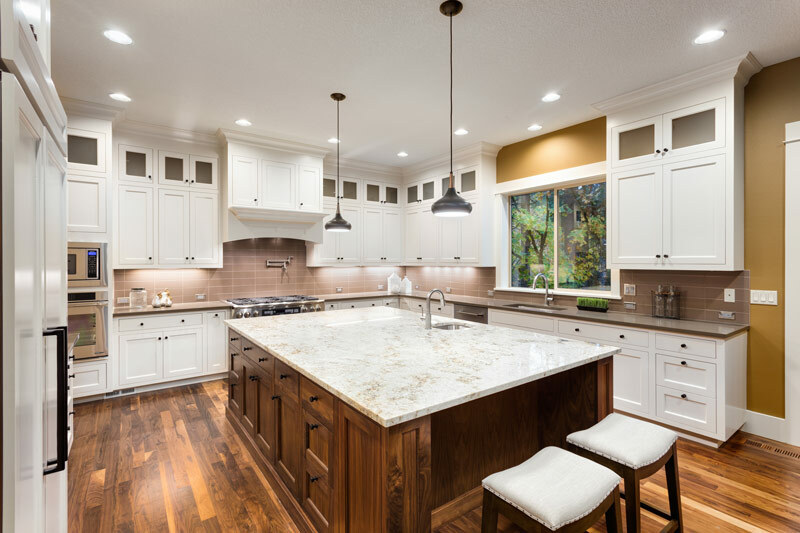 While choosing the right kitchen countertop can be tricky, understanding the pros and cons of each material can help make the decision a little easier! Looking for more tips and guidelines for your kitchen design? 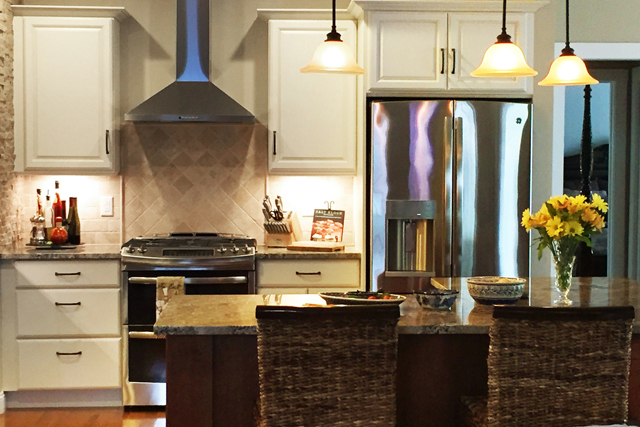 Check out our Kitchen Design Guide!